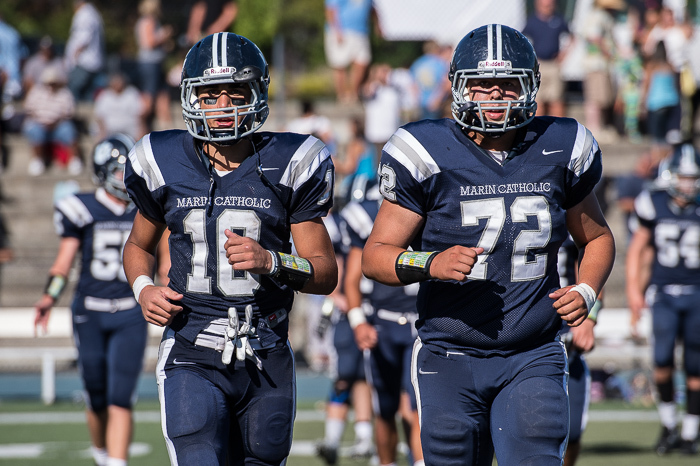 Marin Catholic remains undefeated (5-0) with a 45-6 victory over Terra Linda high school. 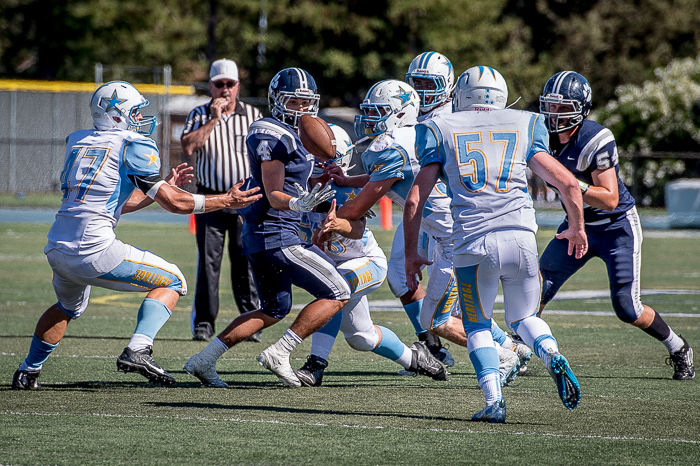 The Saturday game was played in perfect California weather, unlike last week’s rainy victory over Tamalpais. 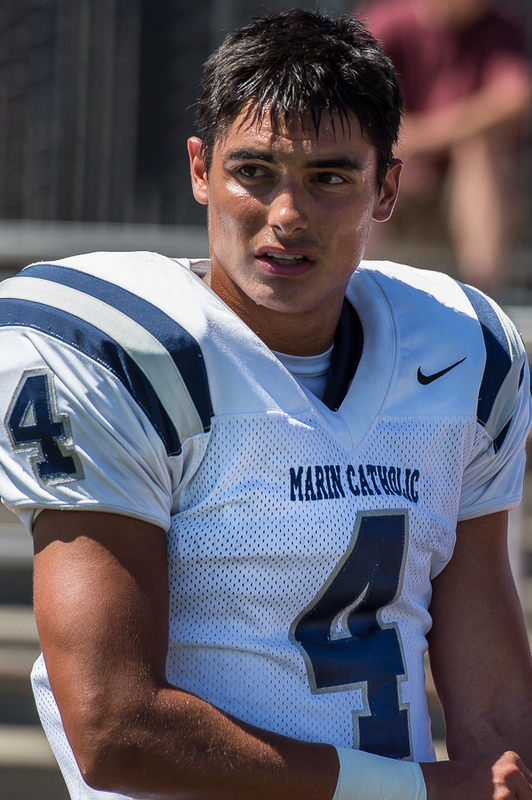 There were some sad moments before kickoff when a special ceremony honored the memory of Dino Ghilotti, a former Marin Catholic defensive back and wide receiver. 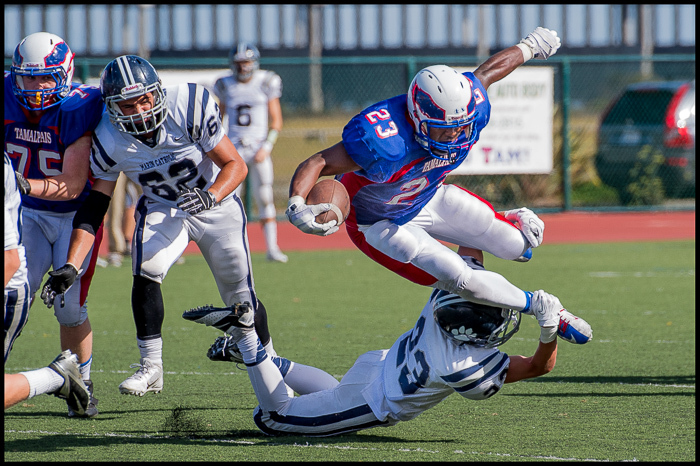 Dino was killed in an auto accident earlier this year, just two days after graduating from the University of Miami. 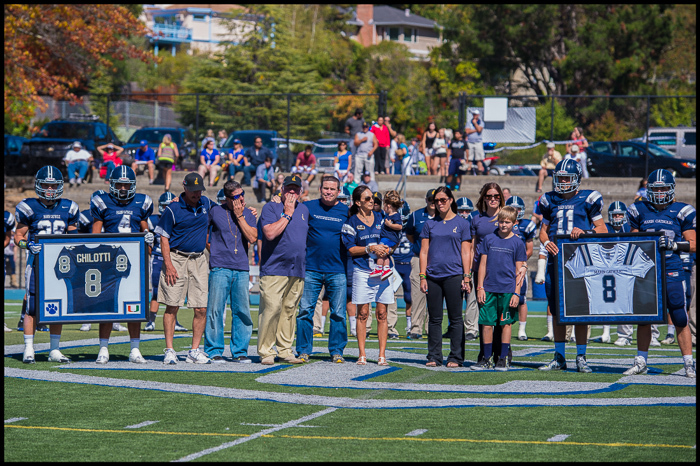 Marin Catholic football retired Dino’s jersey No. 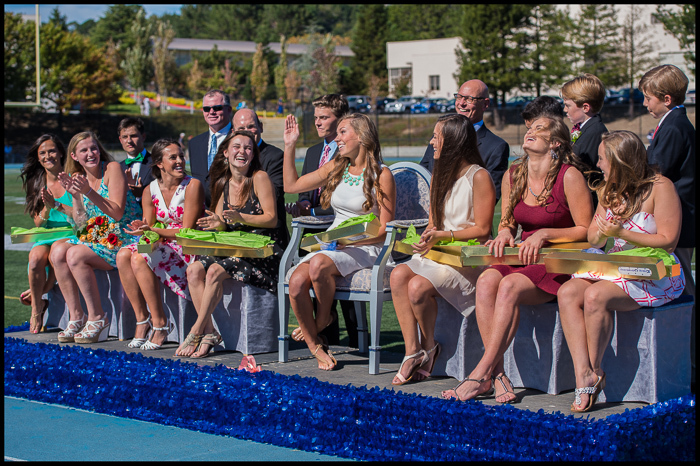 8 at the ceremony. 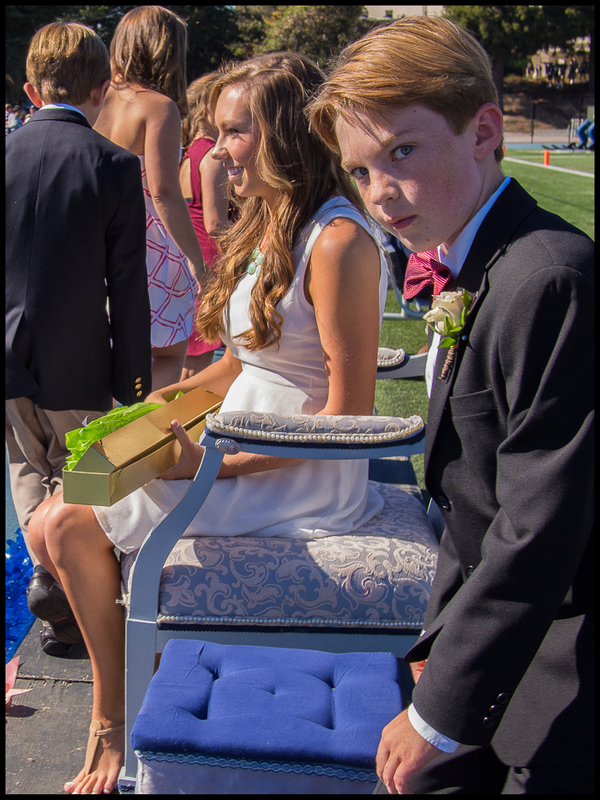 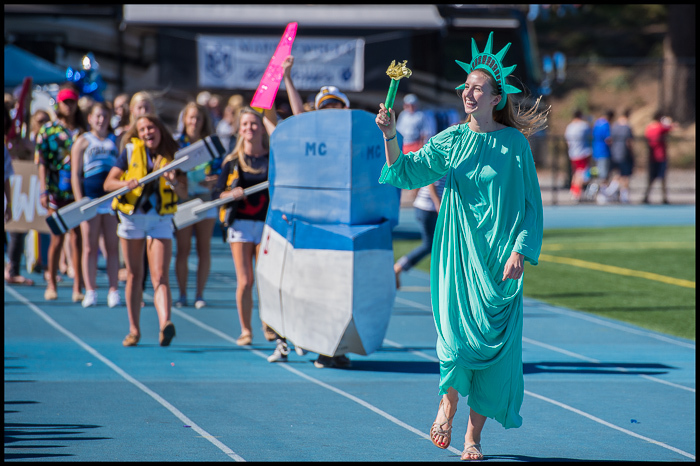 Saturday also happened to be Homecoming, so there were some lighter moments at halftime. 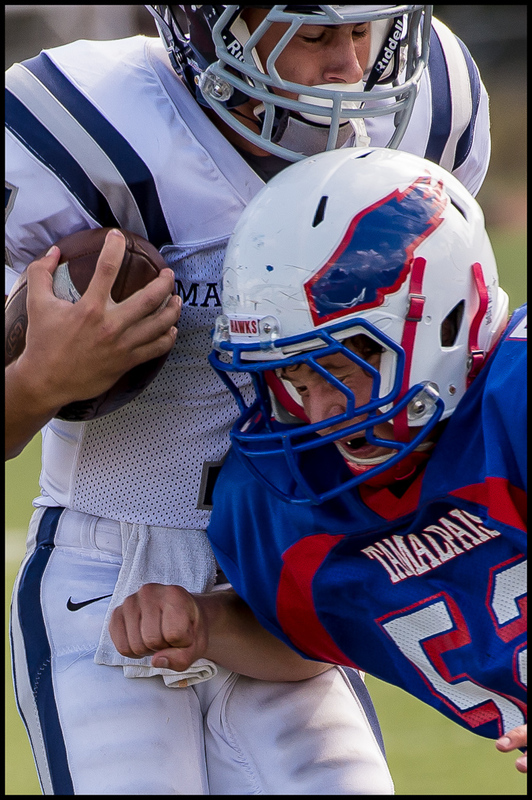 More game photos are at VarsityPix.com. 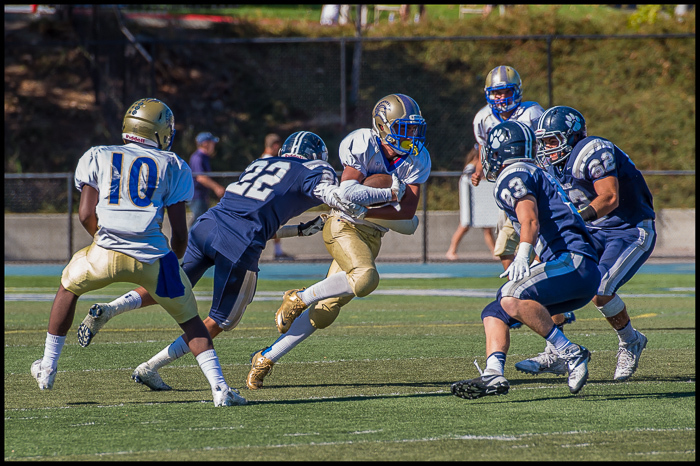 The Marin Catholic football team (4-0) won its opening game of the MCAL season with a decisive 56-7 victory over Tamalpais high school last Saturday. 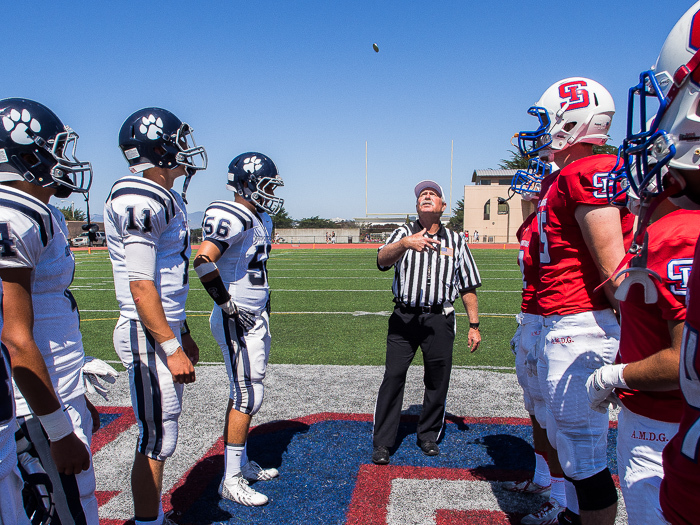 It rained like crazy the first part of the day, but cleared for the opening kickoff. 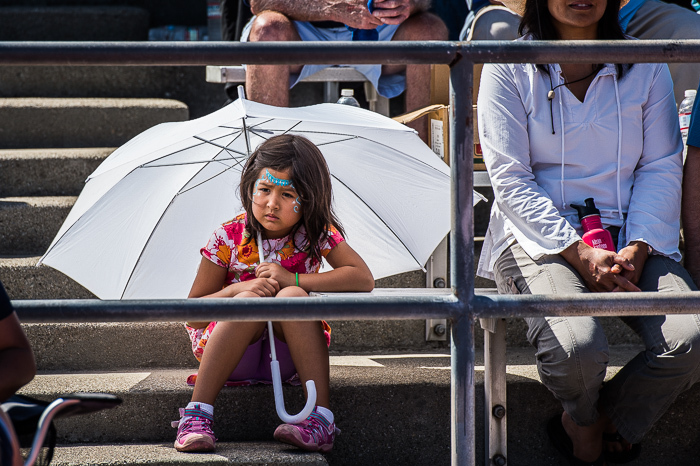 I brought rain gear for the Nikon, but really didn’t need it. 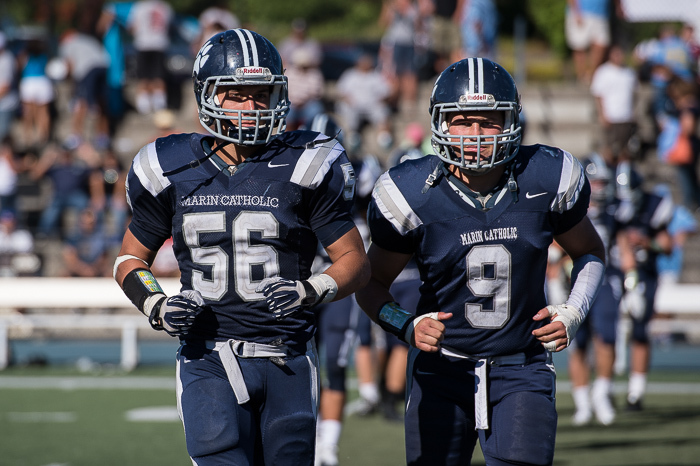 Marin Catholic plays Terra Linda next Saturday. 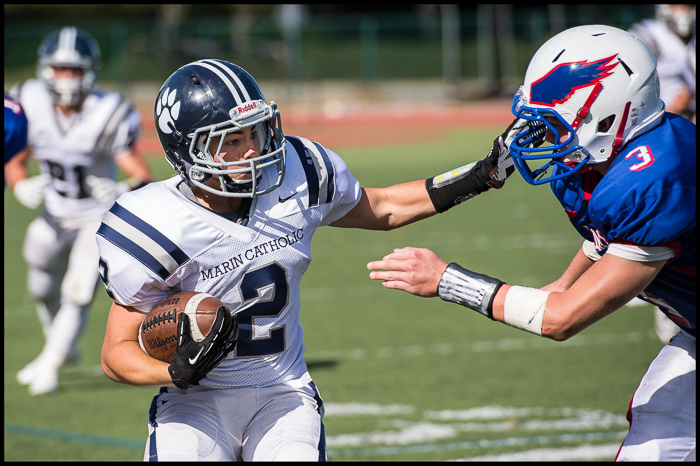 Marin Catholic (3-0) won their final tune-up for the MCAL season over Heritage high school last Saturday with a 42-6 victory. 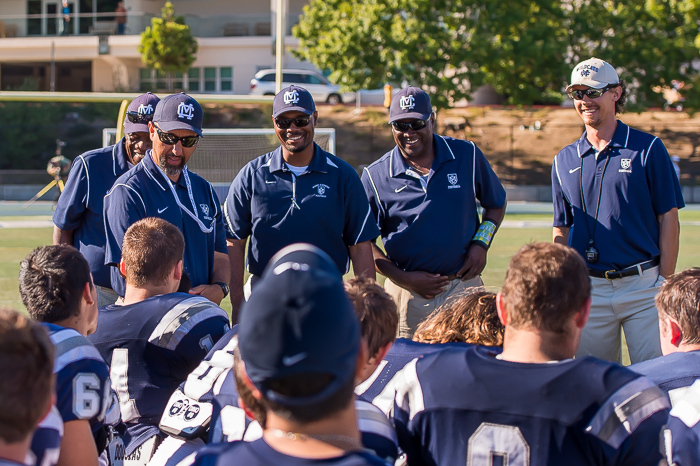 I decided to stay for a moment after the game and was surprised to find that the MC football team remained on the field for about 20 minutes after the finish of play. 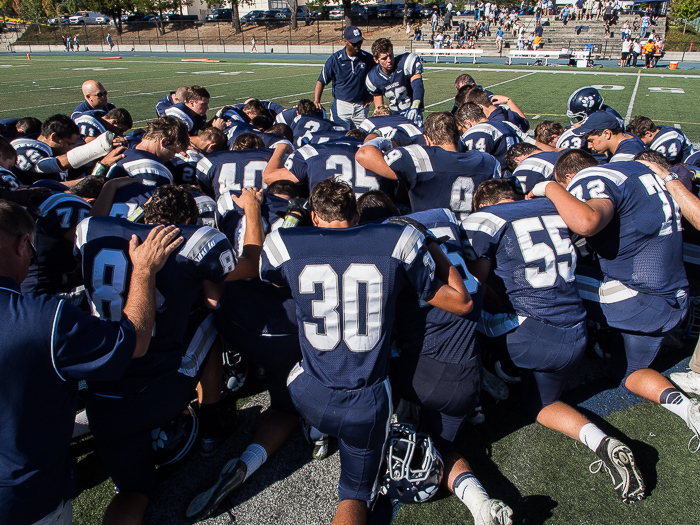 The boys must have been tired, and thinking about hot showers, but showed amazing poise and discipline as they first prayed together, and then listened attentively as each of their coaches reviewed the game. 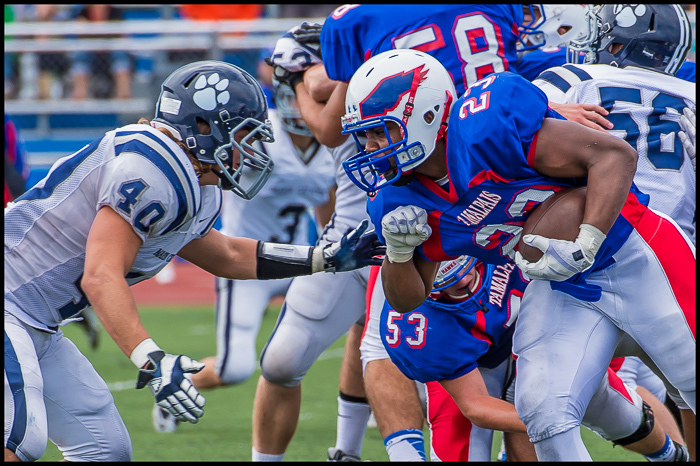 Many more game photos are at VarsityPix.com. 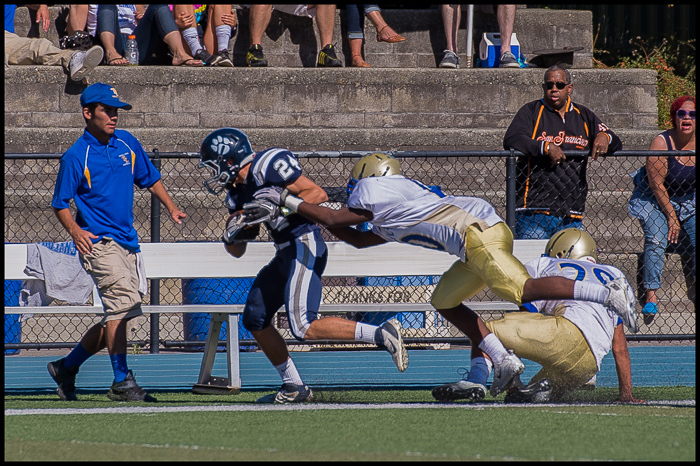 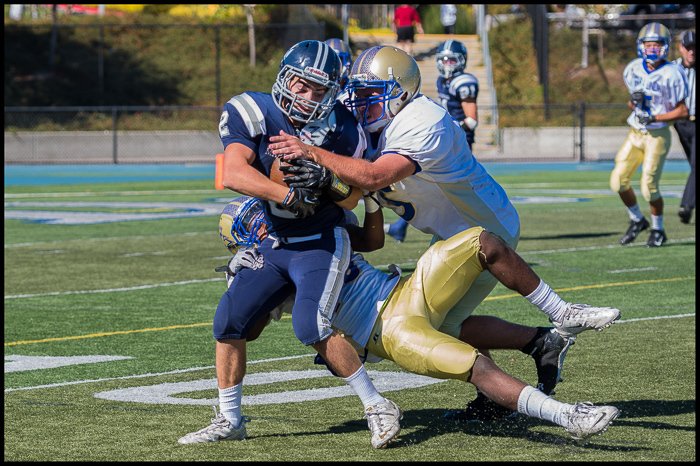 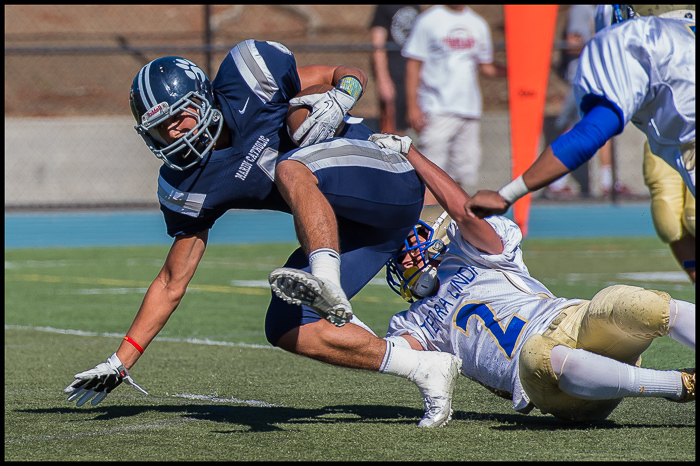 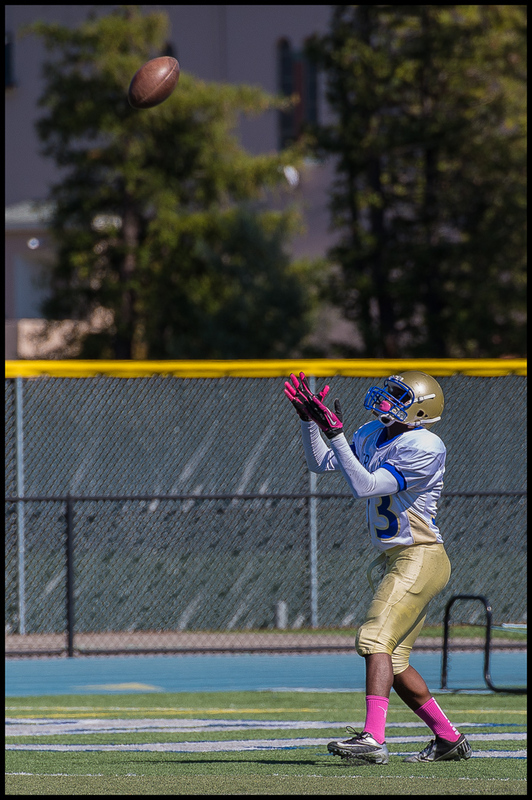 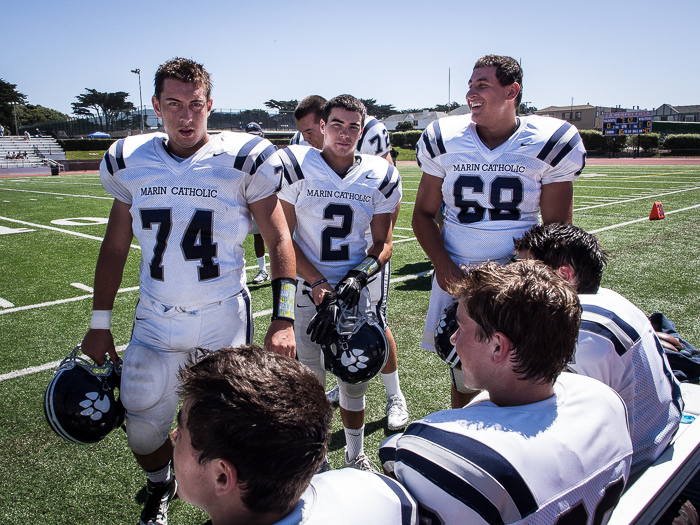 The Marin Catholic football team defeated St. Ignatius high school in San Francisco this past Saturday. 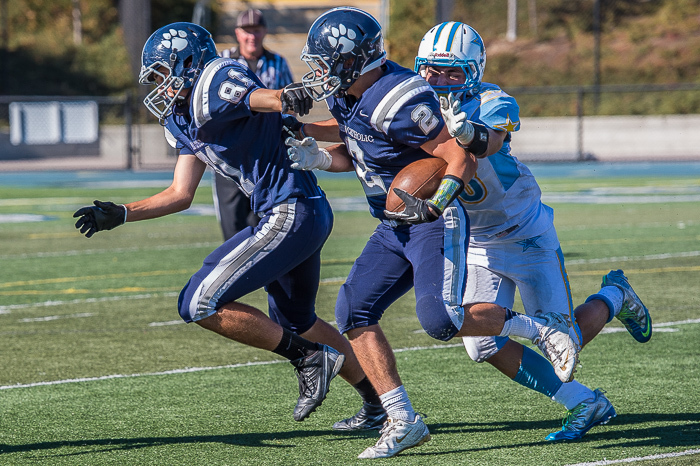 The 31-20 victory was the second of the season for the Wildcats. 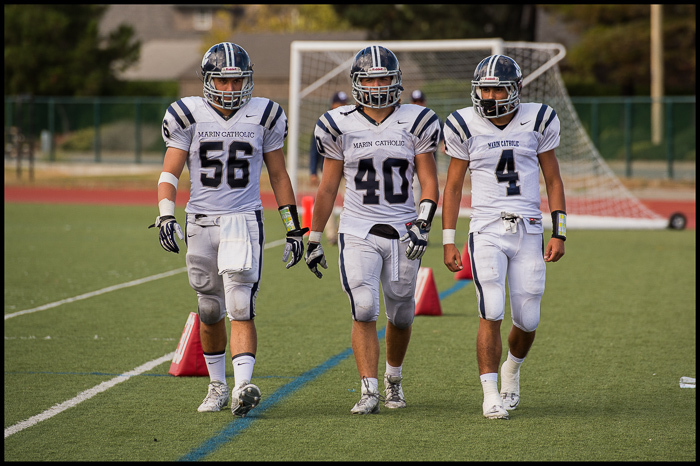 It was an enjoyable game, with standout performances by the whole team, and especially Morgan Mahalak, Nicholas Heimbrodt, and Andrew Celis. 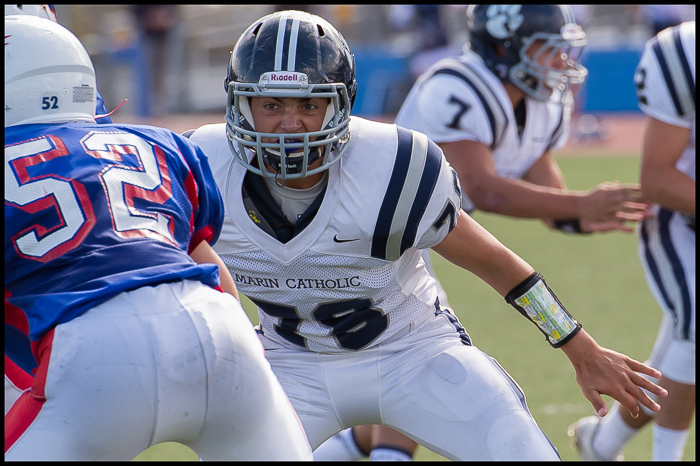 I brought a second camera to the game, an Olympus OM-D E-M5, aiming for a different perspective with wide-angle shots. 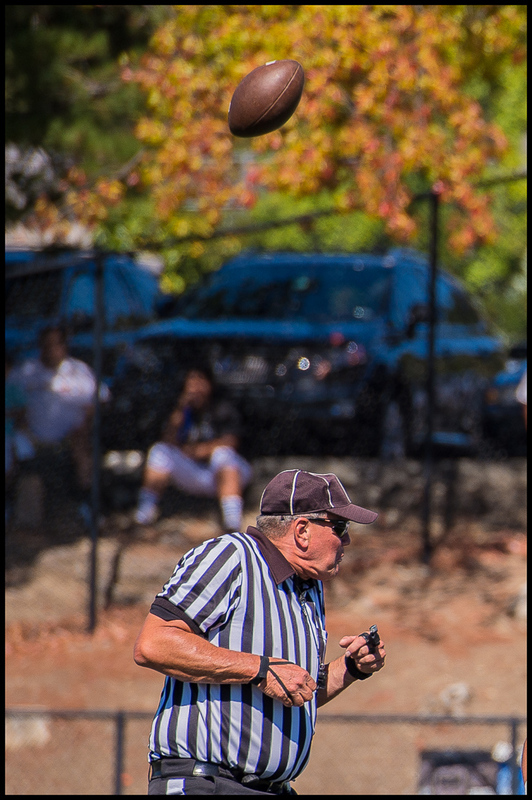 Can you spot the differences between the Nikon and Olympus photos? 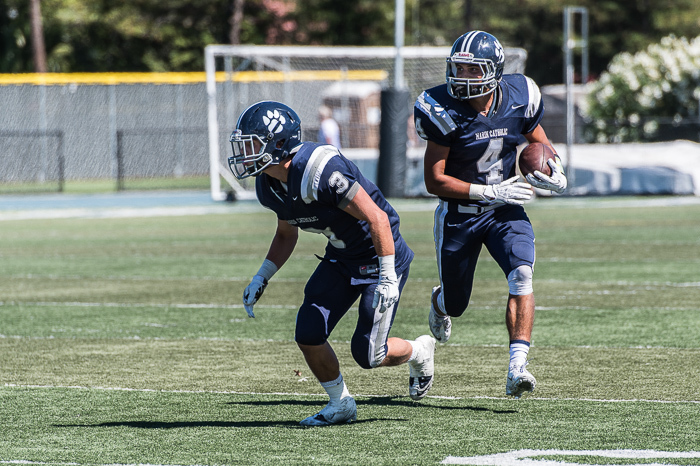 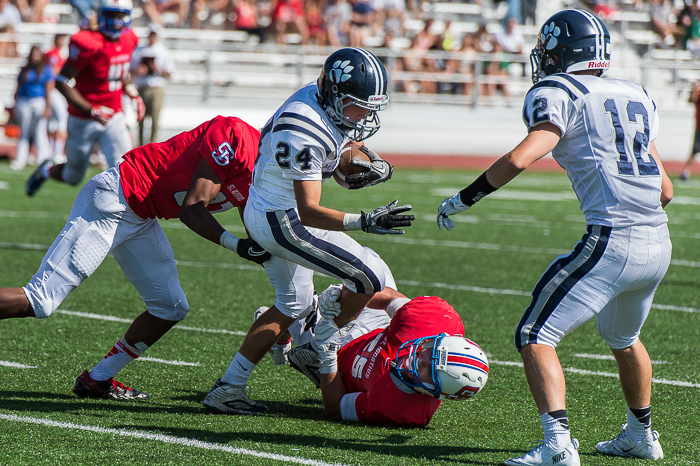 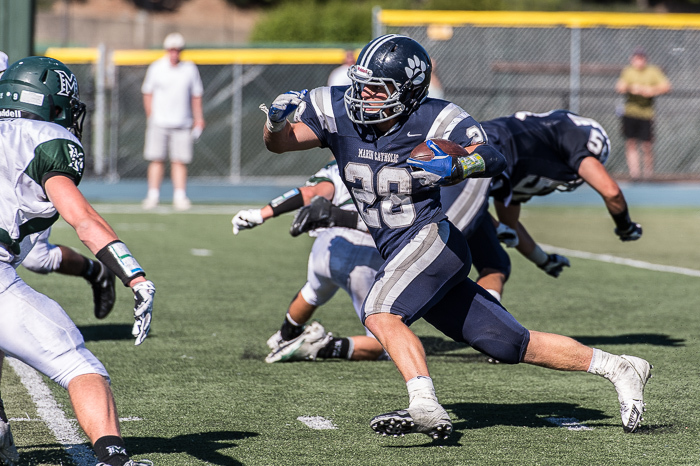 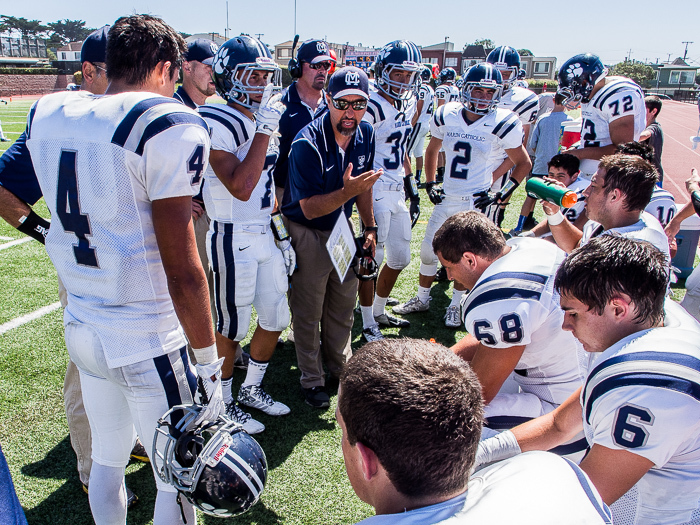 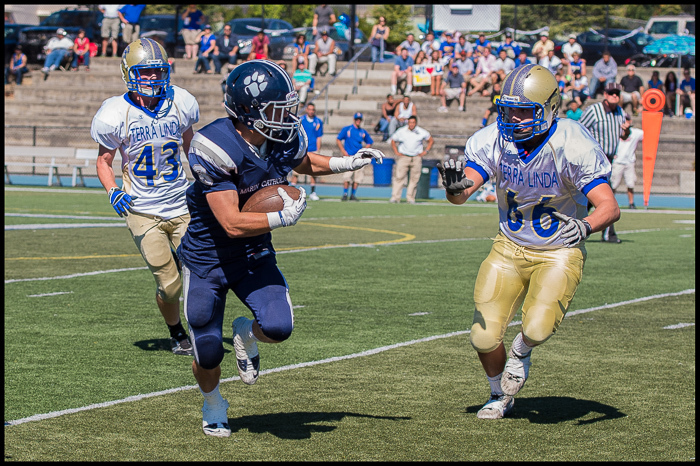 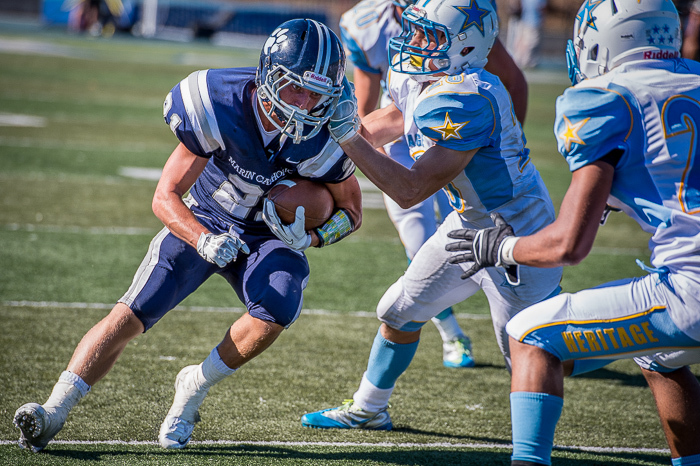 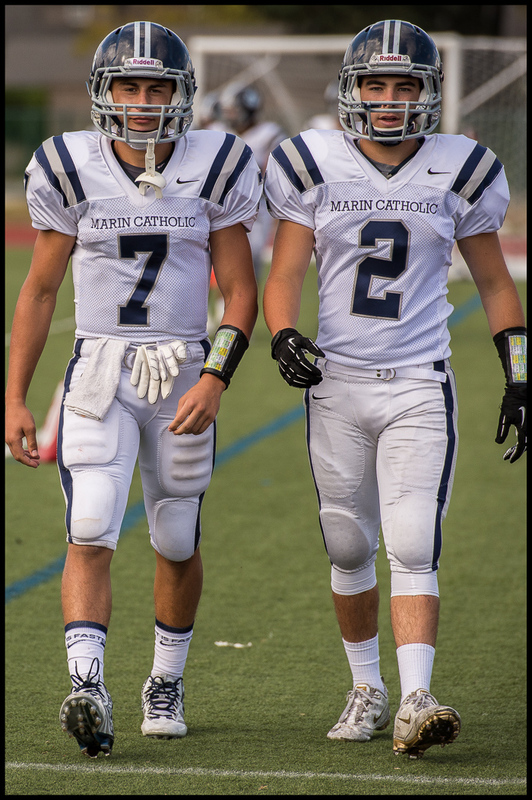 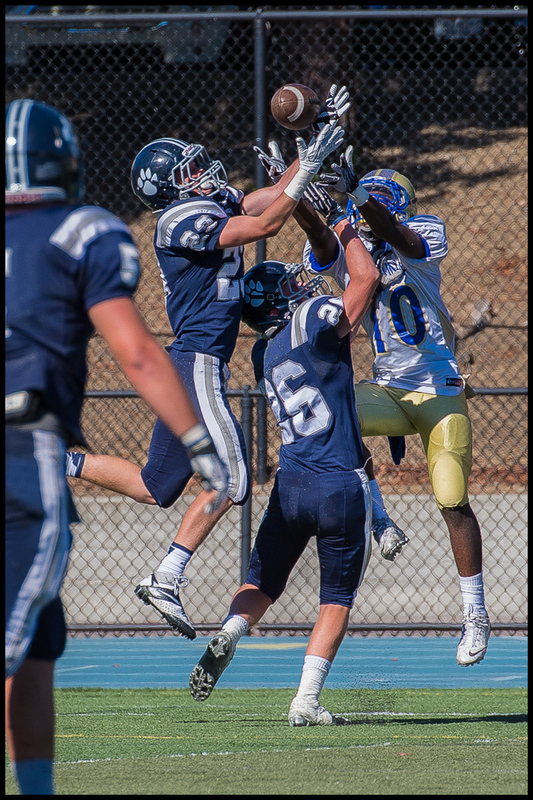 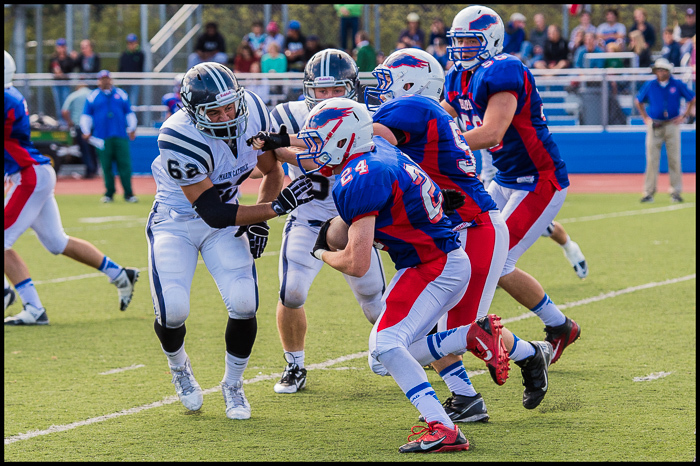 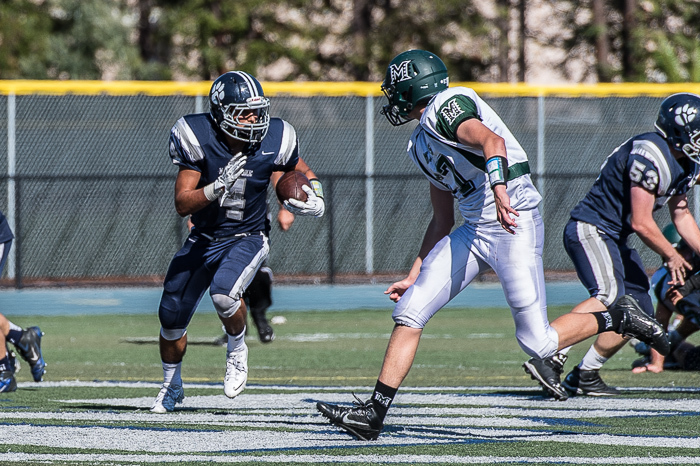 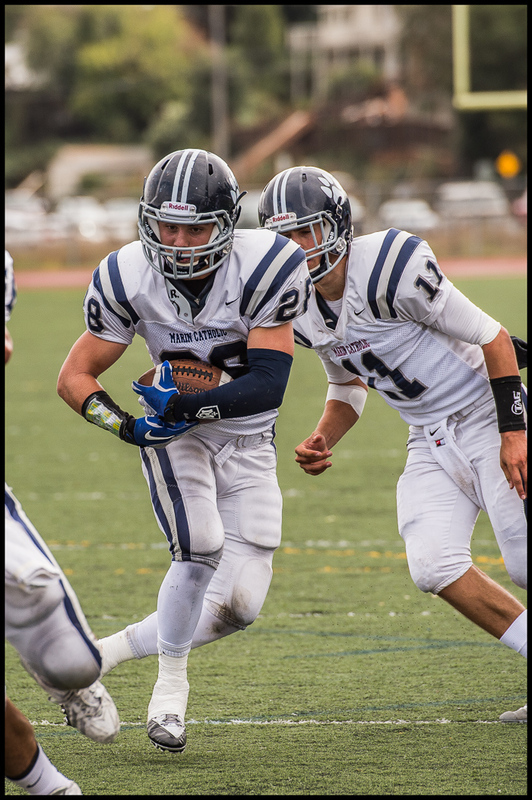 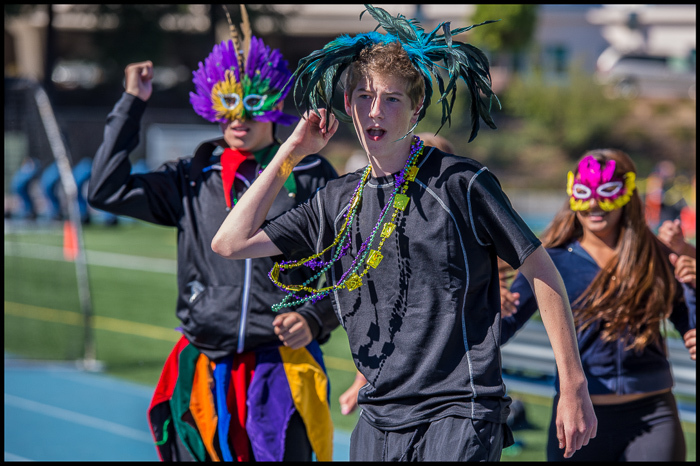 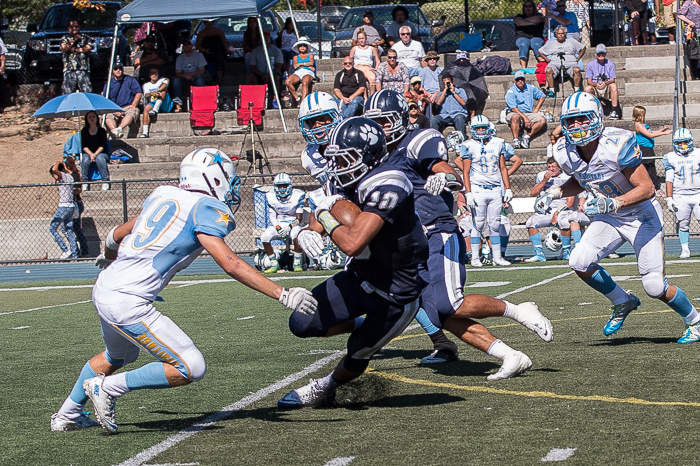 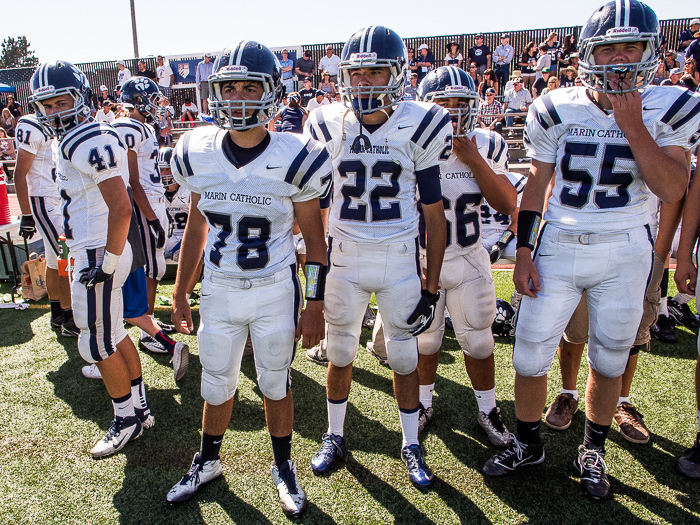 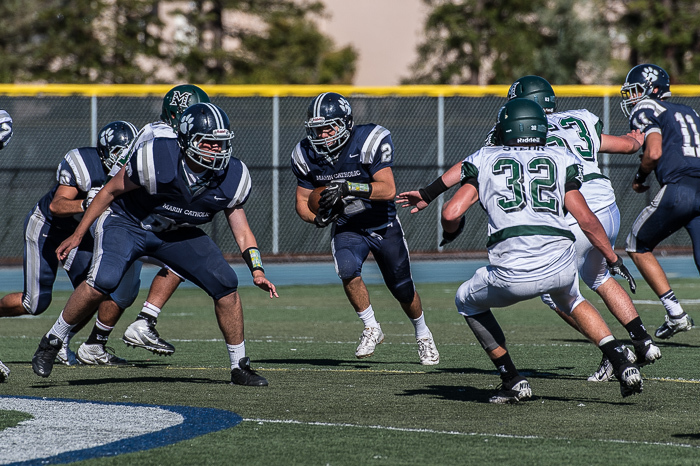 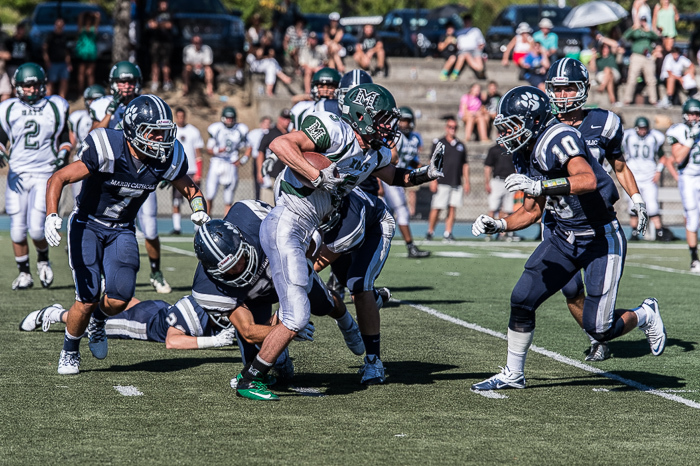 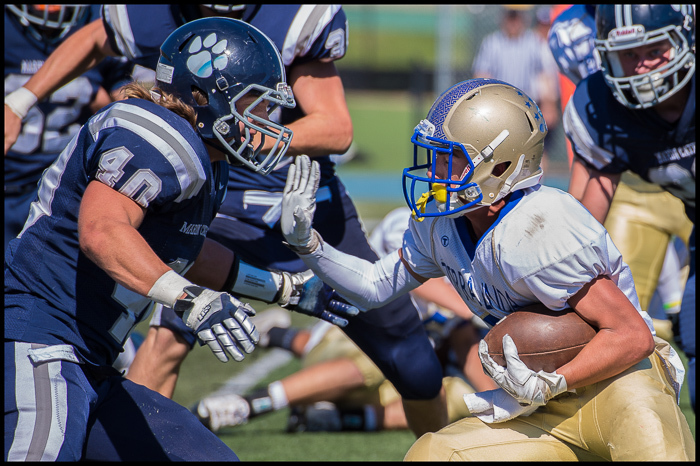 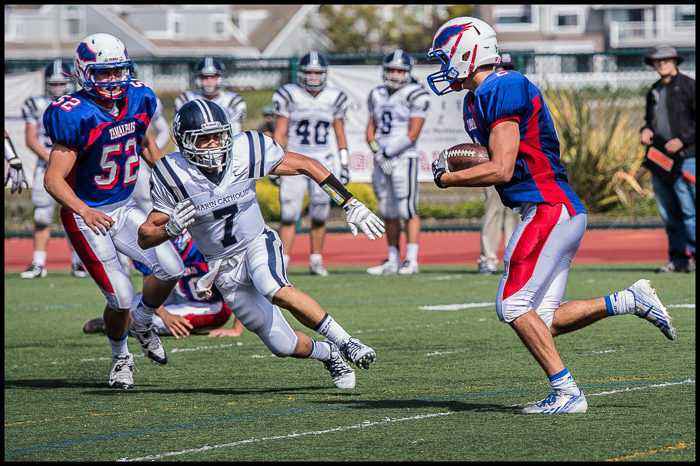 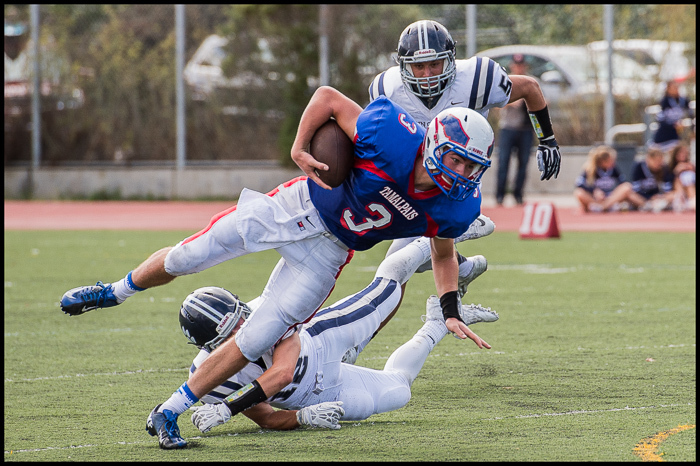 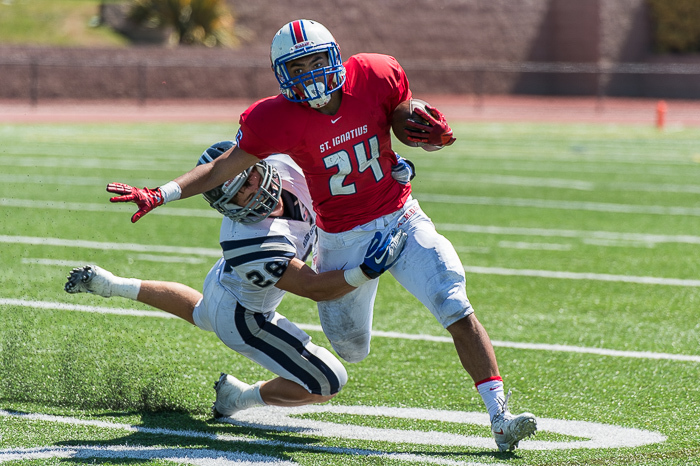 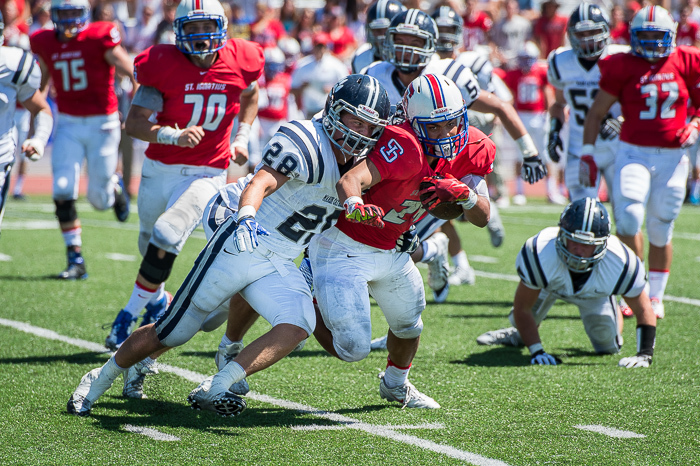 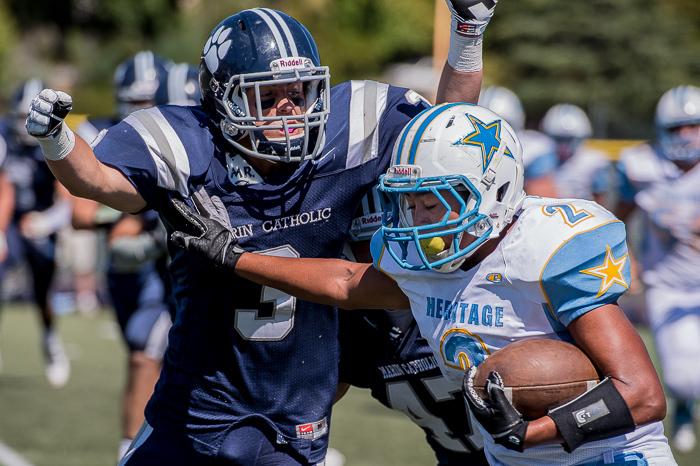 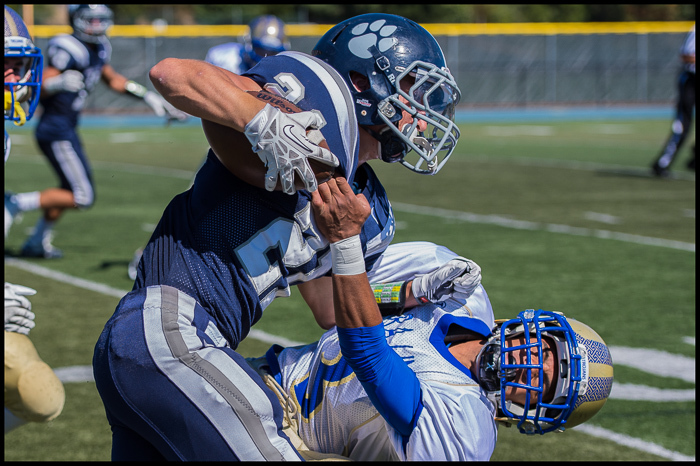 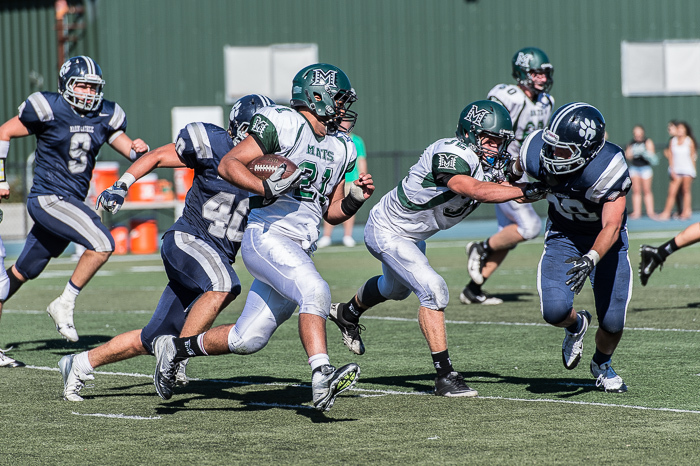 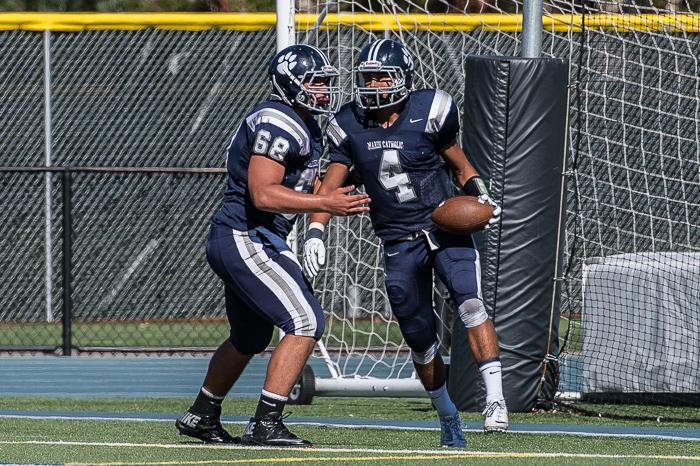 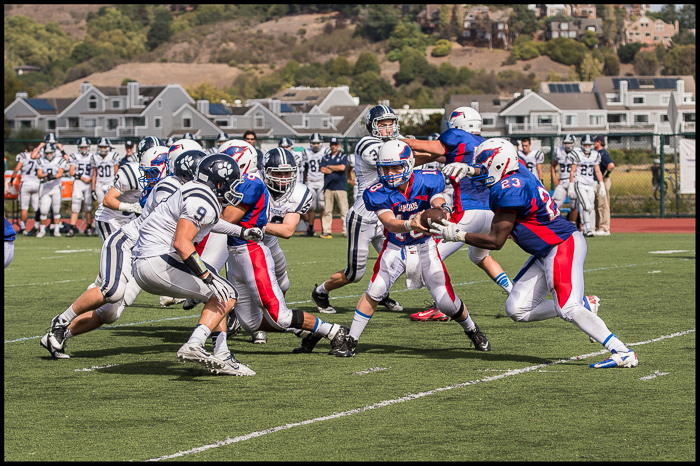 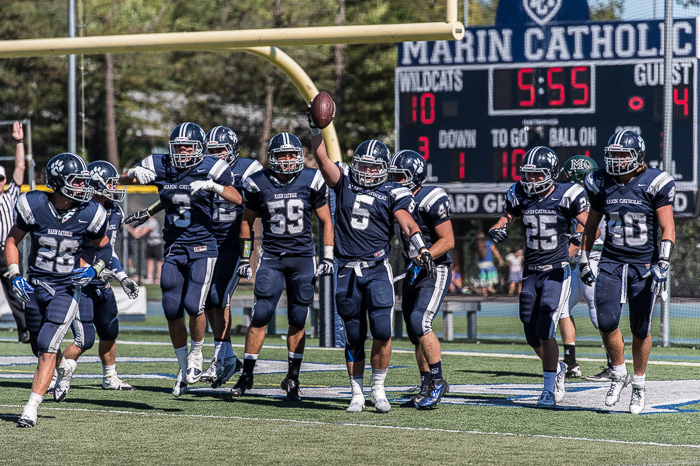 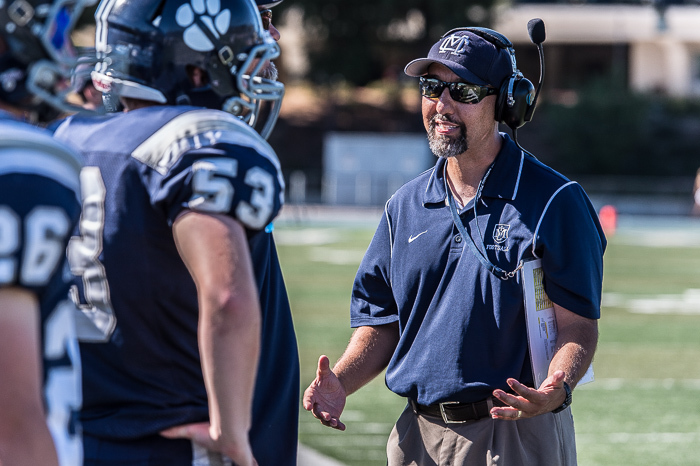 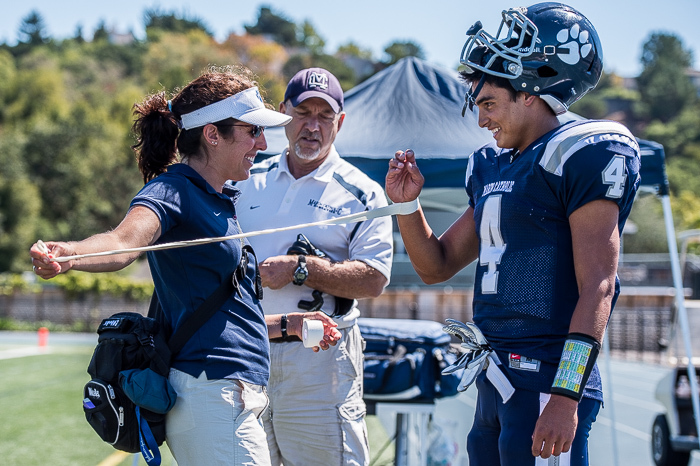 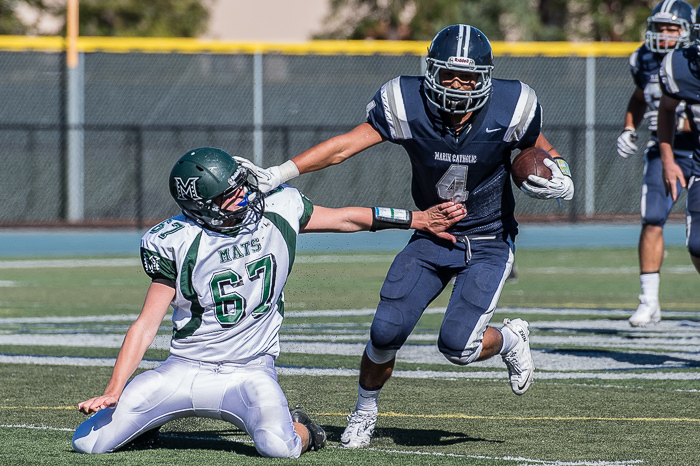 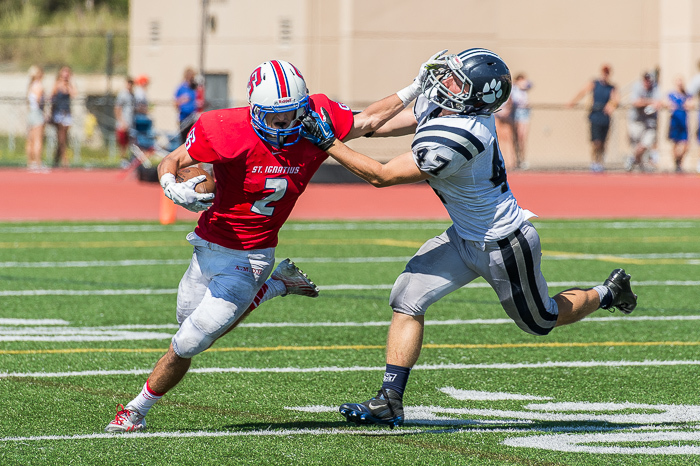 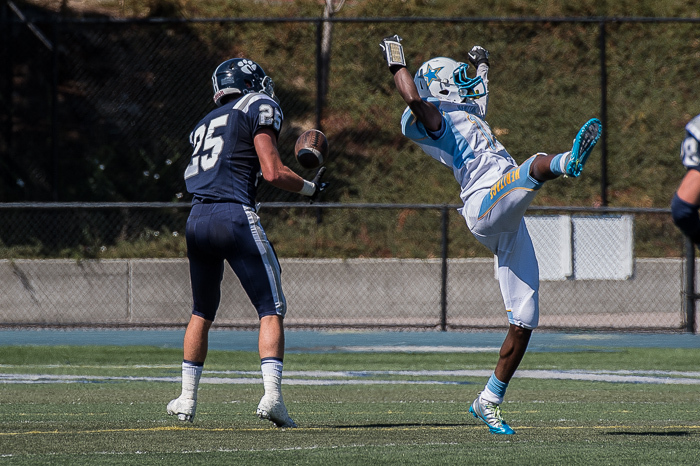 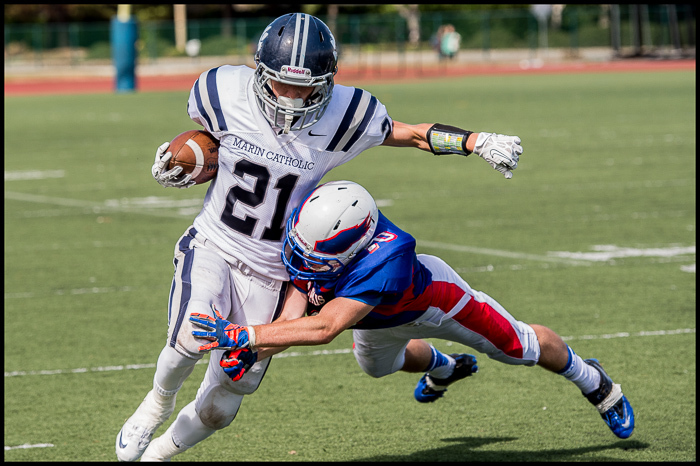 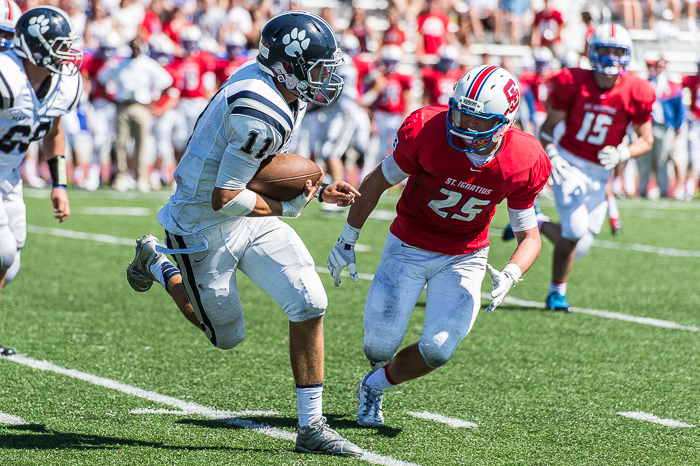 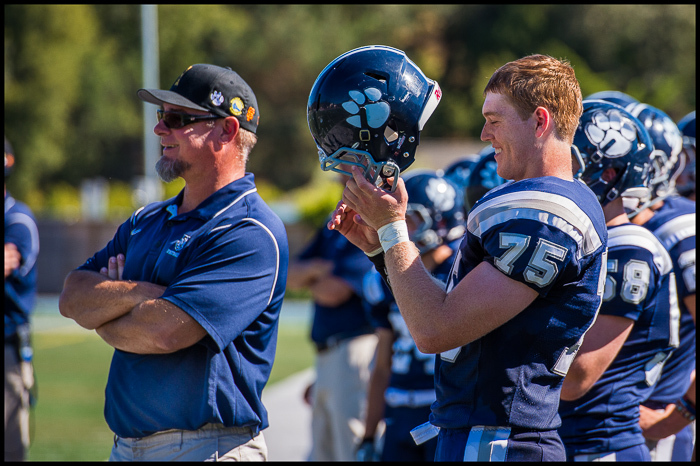 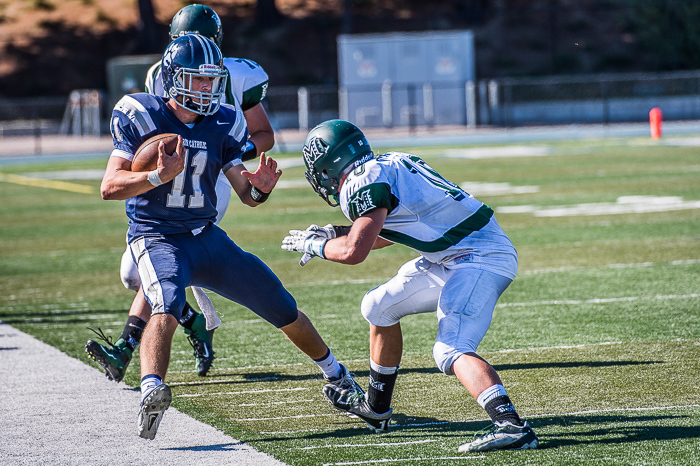 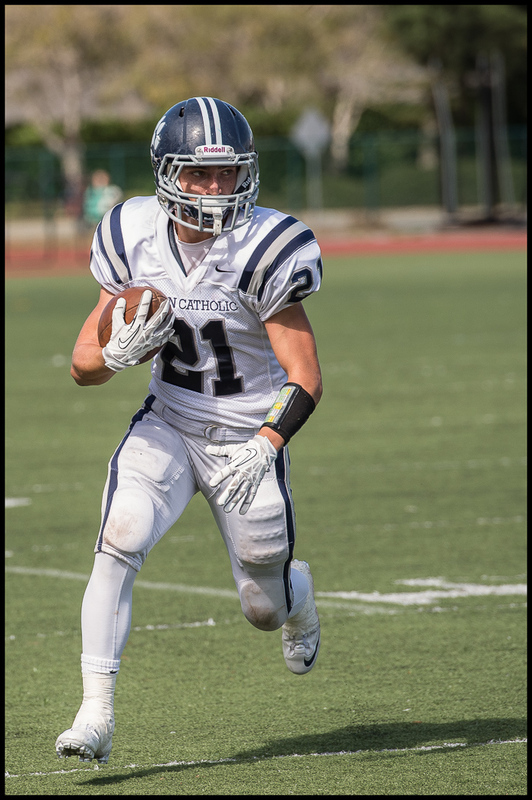 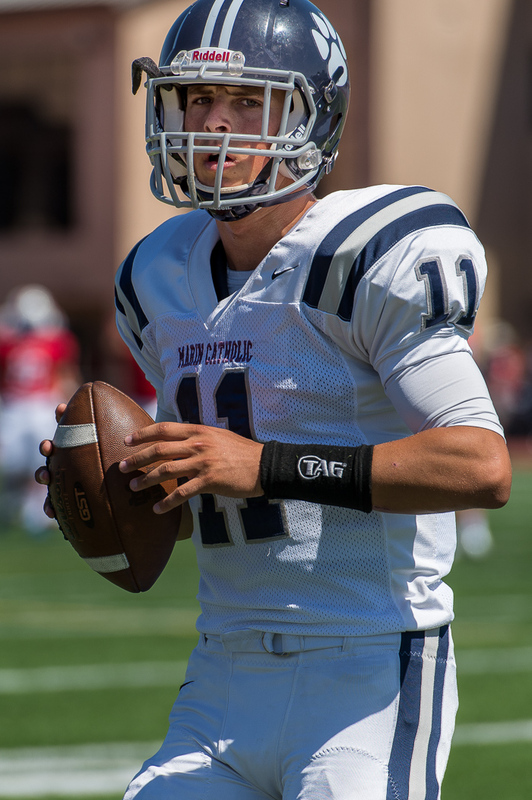 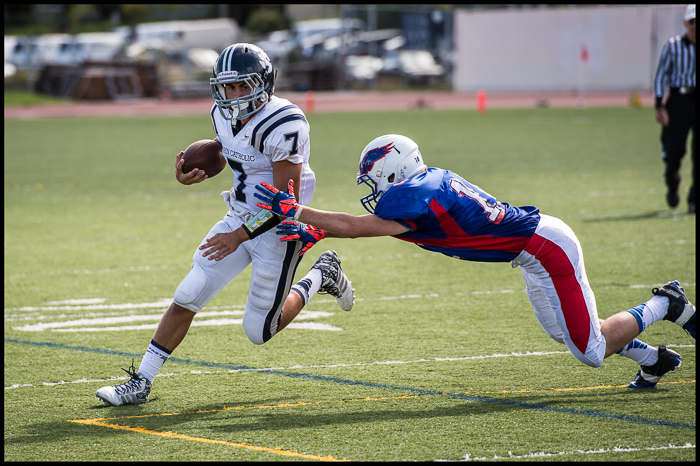 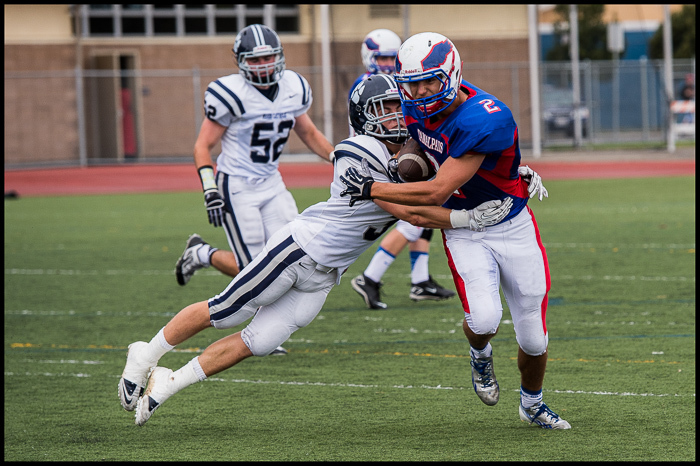 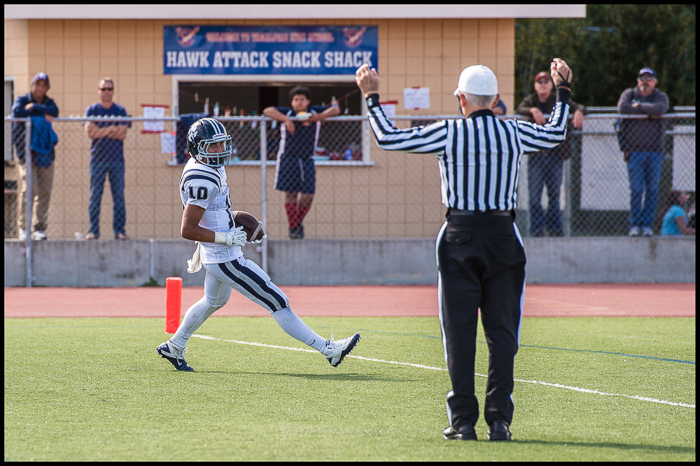 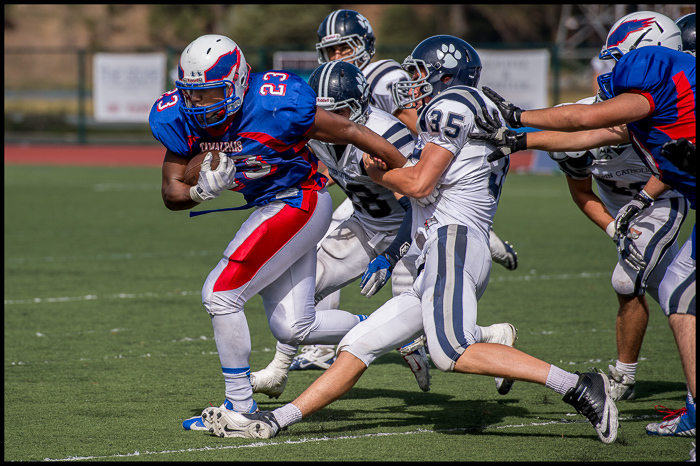 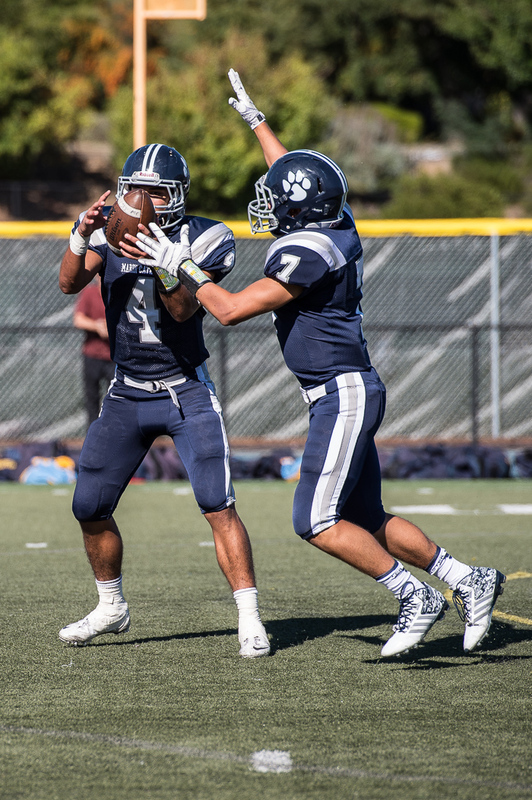 Marin Catholic plays at home this Saturday against Heritage, the final tuneup before the Wildcats enter league play. 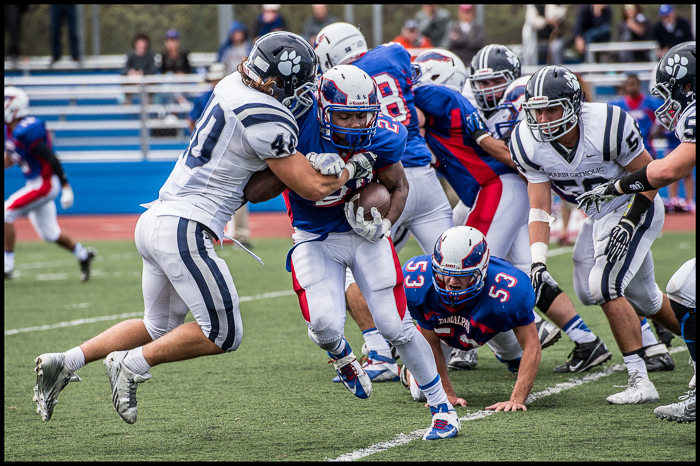 You’ll find many more photos of the game at VarsityPix. 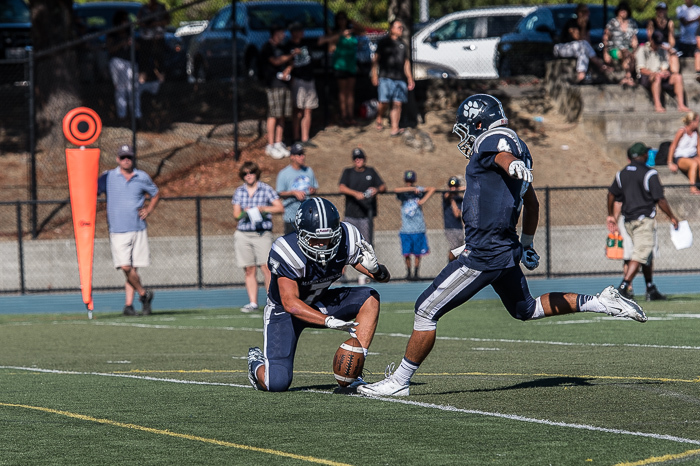 Marin Catholic defeated Miramonte high school Saturday to begin the 2013 football season. 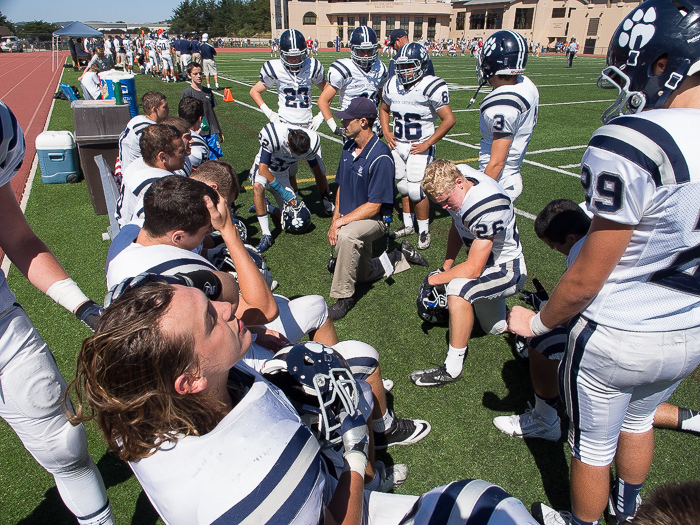 After a slow first half, MC delivered 35 unanswered points in the last two quarters to win 45-14. 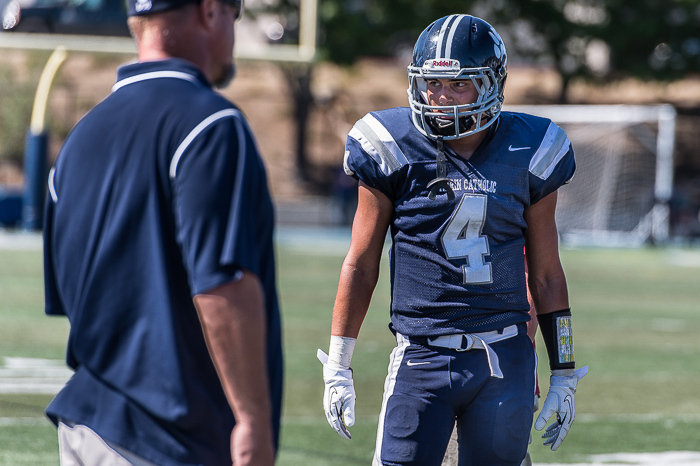 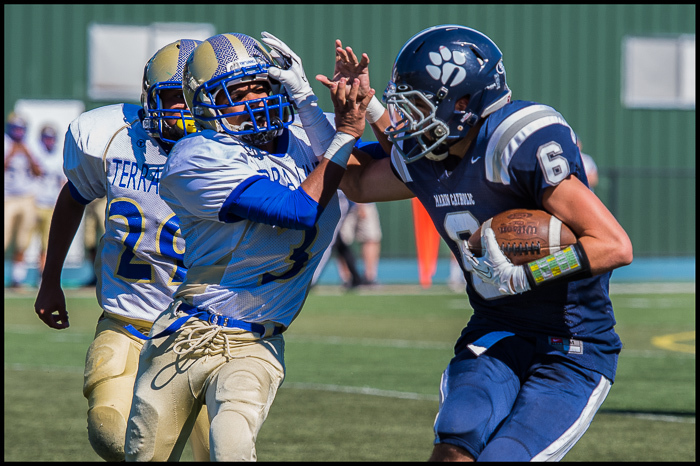 Bill Schneider, CEO of VarsityPix, had advised me to keep an eye on Andrew Celis (4), and I wasn’t disappointed. 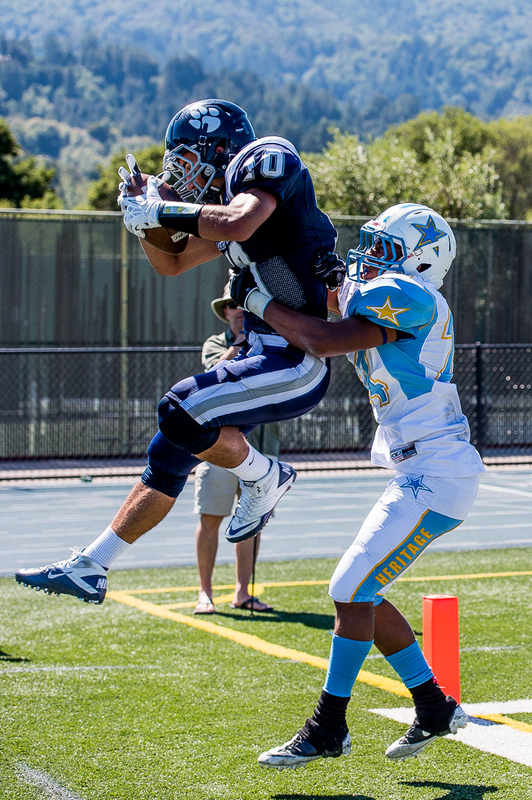 Celis was outstanding in all aspects of his play, including 7 receptions for 167 yards. 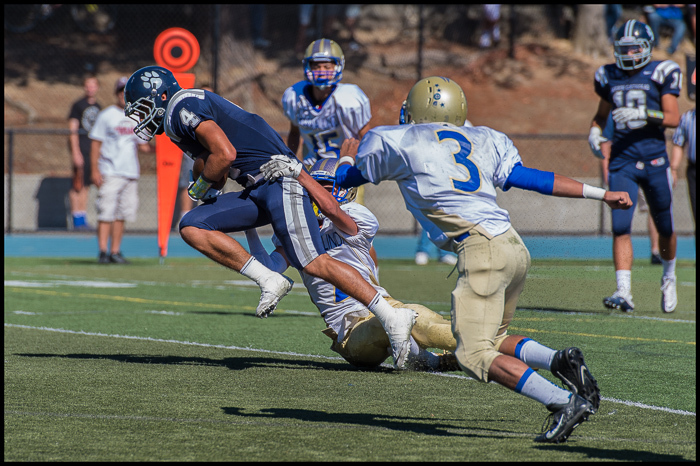 He can run, catch, and kick. 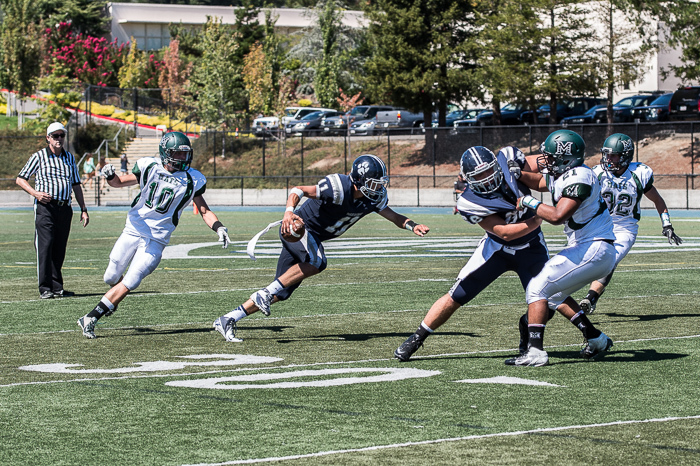 Now I’m just waiting to see if he can throw. 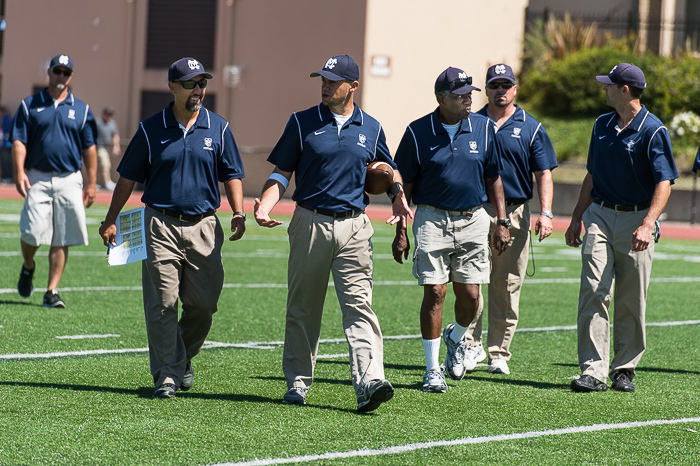 Head Coach Mazi Moayed’s team (1-0) will travel to San Francisco’s St. Ignatius on September 7th. 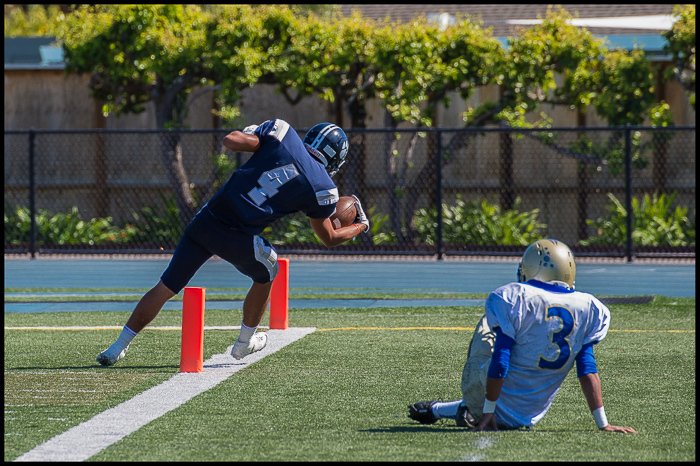 I’ll be there with my Nikon, hoping to continue photographing a winning season.